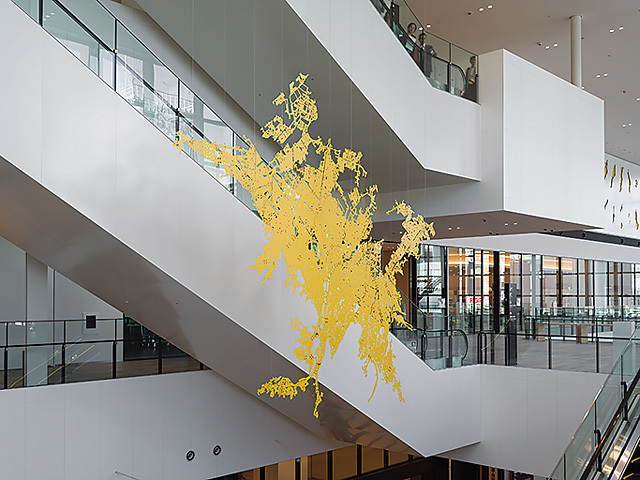 A space with a triple-height ceiling in the Sapporo Community Plaza's entrance hall features the artwork “Hecomi Study—The exploration of Sapporo's shape 2018,” created by Ken’ichiro Taniguchi, a sculptor hailing from Sapporo and currently based in Berlin, Germany. Ken’ichiro has created three-dimensional works using cracks and splits on walls, the ground and other damaged surfaces ─ what he calls hecomi ─ as motifs. The hecomi artwork at the Plaza, which is larger than his previous works, features the geographic contours of Sapporo. “Hecomi Study” is a sculpture created by cutting out parts of Sapporo based on aerial photographs and then dividing them into separate pieces according to the boundaries of the rivers that run through each area before studying the shapes and joining the pieces together into a different shape. While “Hecomi Study” shows the shape of Sapporo, it also looks like a yellow bouquet or boots. In fact, the work looks different depending on the location and angle from which it’s viewed. Viewers are sure to make new discoveries about Sapporo by comparing the three components of this artwork. We hope you’ll find your favorite location and angle from which to view it. “Shape of Sapporo” was created by tracing the contours of the urban areas, the boundaries between forests and waterfronts, scattered green spaces, and the like based on aerial photos of the city. At a scale of 1:6600, the piece decorates the western entrance of the plaza. 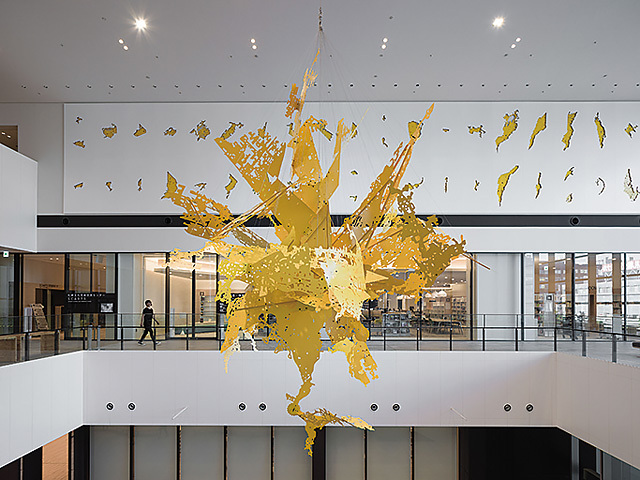 On a wall of the high-ceilinged hall is another component of “Hecomi Study for Sapporo,” which was created by dividing “Shape of Sapporo” into 51 separate pieces along the boundaries of rivers and arranging the pieces like an illustrated book. This 3D sculpture at the eastern entrance of the plaza was created by hinging together its 51 parts and folding them at various angles. The scale is 1:3300. Born in Sapporo in 1976, Ken'ichiro Taniguchi graduated from the College of Fine Arts (Painting Course) of the Hokkaido University of Education (Sapporo Campus). Currently based in Berlin, Germany, he uses hecomi ─ damaged roads, walls and other surfaces ─ as motifs in his sculptures. His major solo and group exhibitions include those held at the Rijksmuseum (the Dutch national museum in Amsterdam), the Rotterdam Historical Museum and the N2 Galeria (Barcelona). He received the 1st Hongo Shin Memorial Sculpture Award. Copyright © Sapporo Cultural Arts Foundation. All Rights Reserved.